Rhamphorhynchus (Beak Snout) on Ginkgo tree branch, Jurassic period. 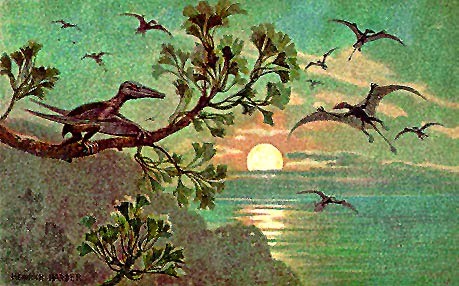 It is a nocturnal pterosaur, a flying reptile, probably eating fish. It is closely related to dinosaurs. on my Fossils-page and History-page.